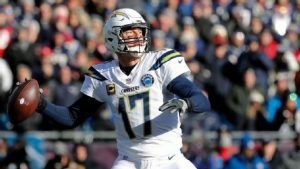 Following one of his best seasons as a pro, which included reaching the AFC divisional round for the first time since the 2013 season, Los Angeles Chargers quarterback Philip Rivers said he wants to play for at least a handful of more years. Entering the final year of his contract, Rivers said his representation has not talked with Chargers brass about a contract extension. On Thursday, however, general manager Tom Telesco said the Chargers want to begin conversations at some point this offseason about a new deal with the quarterback. The 37-year-old quarterback has said he believes he can still play at a high level for years to come and wants to be around when the Chargers open their new stadium in September 2020. “I certainly feel that’s something I want to be a part of and hopefully be helping us still winning football games,” Rivers said. Rivers finished the regular season fifth in the NFL in passer rating (105.5), tied for sixth in the league in passing touchdowns (32), eighth in passing yards (4,308) and ninth in completion percentage (68.3), earning his eighth trip to the Pro Bowl. Indianapolis Colts quarterback Andrew Luck replaced Rivers in the annual all-star game due to an ankle issue. “Philip played really good football this year,” Lynn said. “He was very consistent. He was playing at an MVP level, and that’s a credit to him, being 37 years old and coming back in the best shape of his life.